MishMish Cafe offers a local authentic Mediterranean cuisine right off Bloomfield Avenue with a homey atmosphere at an affordable price. MishMish Cafe makes a bold statement in Montclair as locals can’t stop talking about it! According to MishMish Café’s clientele, it is easy to lose track of time whenever they visit the local Mediterranean café. The staff is overwhelmingly friendly, the atmosphere is homey and the food is not only delicious and unforgettable but it is also reasonably priced. MishMish Café is a Mediterranean restaurant located on Glenridge Avenue in Montclair. Although their doors only opened a few months ago in December of 2014, they have made quite a buzz around town. The restaurant seats about 30 people and has an open kitchen concept, allowing diners to not only have a warm and welcoming dining experience, but they can also witness chef Meny Venkin preparing their food. Venkin, who was born and raised in Israel, moved to the United States 10 years ago and studied at the famous French Culinary Institute. Along with his techniques training, Venkin uses what he learned from his mother and grandmothers. His perfect combination of family teachings and what he was taught in school allows Venkin to create one of kind dishes with Moroccan influences. Whether you are looking for a new and exciting dining experience, or already have a love for Mediterranean food, MishMish is the place to be. A favorite amongst customers is the Sloppy Josepht, the Mediterranean version of a Sloppy Joe. Inside this mouthwatering sandwich is slow oxtail ragu paired with garlic confit. Another popular and authentic item on the menu is the Shakshuka. This is a traditional baked egg dish and a common breakfast food in Israel. Served in a skillet are two poached Morroccan eggs baked in stewed tomatoes, topped with feta cheese and za’atar (a Middle Eastern spice mixture). MishMish means apricot in Hebrew and Arabic. Why apricot you ask? Vankin’s mother always had a bowl of dried apricots on her table to welcome guests. Before opening his own restaurant Vankin worked for some of the best of the best in New York. Recently Vankin participated in a Food Network competition show; the show has not been named yet but is set to air later this year. 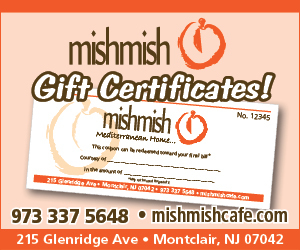 MishMish Café is located at 215 Glenridge Avenue, right off Bloomfield Avenue. Join them on Facebook to stay up to date on any current promotions and daily news, @mishmishcafe and follow them on twitter @mishmishme and Instagram @mishmishmontclair. They are open Tuesday through Thursday 11:30 a.m. to 9 p.m., Friday and Saturday from 11:30 a.m. to 10 p.m. Join them on Sunday’s for Brunch from 10 a.m. to 4 p.m. or for dinner from 4 p.m. to 8 p.m.